Adding names and editing the Depositor and Payee name files. All Mac users are familiar with using preferences to establish the desired behavior of applications. For the check register I'll use one simple preference to demonstrate how preferences can be saved. As you may know, application preferences are saved in a Preferences folder located in the Users Library, commonly denoted thus: ~Library/Preferences. To demonstrate a preference I'll offer a choice of how CheckWindow operates. 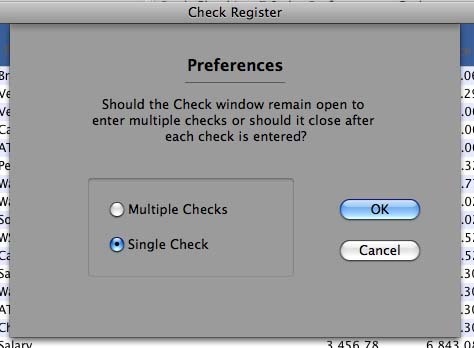 If the user wants to enter more than one check during a single session, it is more convenient if the window remains open rather than closing after every check entry. To allow that window response, I'll make that choice a preference. Note that the if-then test looks at which radio button is selected, sets manyCheck accordingly and sets the change flag. o.writeline "manyCheck" + chr(9) + "true"
o.writeline "manyCheck" + chr(9) + "false"
The call to readPrefs is placed in the transWindow initialize method so the manyCheck flag is set upon application start. Note that if a preference file is not found, the prefsHaveChanged flag will force writePrefs to write a file when the application closes. The only remaining task is to get the preferences window to open. As you know the Preferences menu item always appears in the Apple menu but RB doesn't have a way to place any menu item in the Apple menu. Instead, RB places the Preferences menu item in the Edit menu, and in the Property/Value table its Super is set to PrefsMenuItem (See Figure 2). This tells RB that when the application is compiled, the Preferences menu item must appear in the Apple menu. This added code obviously closes the window if manyCheck is false. If it is true, this code reconfigures CheckWindow to its original condition so another check can be entered. Occasionally I may enter a new transaction out of sequence. Obviously, I'd like the Register to remain in date and check-number order. I accomplish this by adding a new testEntryDate method to globalFinancial that will compare every transaction with the last entry and call for a sort if the transactions are out of order. I add a call to the testEntryDate method to OK button action events of the three types of transactions I have programmed: CheckWindow, DepositWindow and atmWindow. This will insure that any out-of-sequence transactions are handled properly. A pointer to the last transaction (lineNr) is sent to the testEntryDate method and the comparison is made to the transaction before lineNr. Those of you who have persevered with these articles from the beginning may recall that transWindow's transList has a hidden column 0 in which I stored the transaction date in totalSeconds, RB's master property for storing date/time variables. This allows me to do a date sort using column 0. Adding a new VoidCheck window. // Is entry outside the check number range? MsgBox "That is not in the range of Check Numbers for this year"
if not isEdit then transList.addRow""
This insures that the new record is simply inserted in place of the old record. From time to time, the Depositor and Payee name files will may to be edited. A company name could change, or there might be a new name or one you no longer use. To accomplish this edit, I'll build one new window that will be used to edit both the Depositor and Payee name files. This window, EdList, which is shown in Figure 4, is equipped with a listBox, an editField, three radio buttons and two push buttons. It will contain the following new properties: EditIndex as integer, incomplete & replace as boolean and listMod as string. It will be called by two new menu items in the Edit Menu, Edit Depositor List... & Edit Payee List..., that I will construct just as I did the Void Check... menu items above. When this application was built, the Depositors List and the Payees List were only opened by the DepositWindow and the CheckWindow respectively. Now these lists must also be opened by the new EdList, so I need to add four new properties to globalFinancial to accommodate the two lists: depList(0) and payList(0) as string arrays, and nDepositors & nPayees as integers. In addition I'll add three new properties to globalFinancial to accommodate the editing: depositorsChanged and payeesChanged as boolean, and newName as string. The application will now read the two list files upon opening by adding code to the initialize method. From here on I will describe only the code associated with the Payee functions. The Deposit functions are the same, but of course use a different file. This is essentially identical to the method in the CheckWindow that read the file into the window's listBox but now reads into the array payList. When the CheckWindow opens it merely reads this array into the listBox. 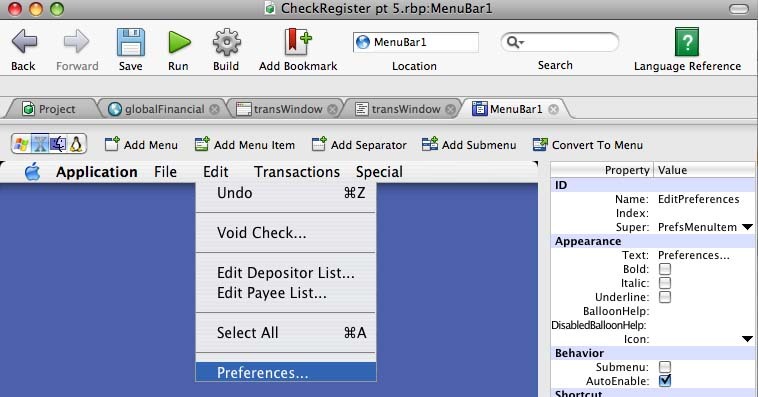 The Depositor Edit handler will contain the list parameter, "deposit" instead of "payee." self.Title = "Edit Depositors List"
self.Title = "Edit Payees List"
Again, Select Case defines which set of commands are executed. In the payee case, the names from the array payList are loaded and sorted. msgBox "You must have an entry in the edit box"
msgBox "You must select a name to replace."